After a torrential storm flooded the day centre at Sue Ryder Leckhampton Court Hospice, staff at Bovis Homes heard the call for help and were keen to support the charity. The purpose-built day hospice building was refurbished just two years ago, but following a deluge of water, which seeped through the floor, the building sadly became unusable. Staff at Bovis Homes' nearby Western regional offices in Bishops Cleeve quickly went into action and raised £100 through a dress-down day. 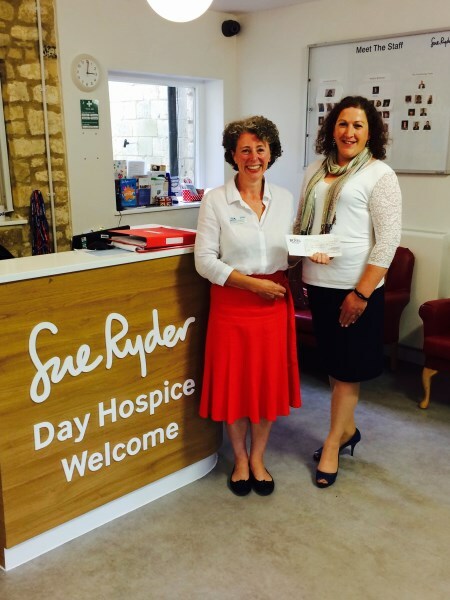 Regional Marketing Manager, Sally Smith, then visited the day centre and presented the cheque to Day Hospice Manager, Beccy Day. "These unexpected events can hit a charity hard, and when I heard about the flood I asked the staff to help and they obliged," said Sally. "It's a charity close to our hearts as the centre helped one of our colleagues and family. The hospice does fantastic work in supporting those in need." Although insured, the hospice has been required to meet the insurance excess, which in itself could pay for 50 days of expert nurse care. Day Hospice Manager, Beccy Day, said: "I know I speak for everyone at the hospice when I say we have been truly touched and overwhelmed by the response we have received in the wake of flash flooding to our day hospice. "The flood really could not have come at a worse time for us. Like many other charities we're struggling in the current financial climate and we were faced with the possibility of having to divert precious funding away from providing care to cover the costs associated with this incident. "As a charity we rely on the support of the local community we care for, and donations from fantastic individuals, groups and businesses like Bovis Homes, have meant we did not have to divert funding away from providing our care."